Summary:The economy of Plovdiv produces output of €4.2 billion annually, of which half or €2.1 billion in manufacturing, €500 million in construction, and €260 million in transport and logistics. IT & professional services together generate annual output of €110 million. The Plovdiv region holds many logistic advantages. The region is a prime road and railway hub in southern Bulgaria. It is a major link in the chain of the transport routes connecting Europe and Anatolia (Asia Minor) and an intersection point of three Pan-European corridors (IV, VIII, and X). The economy of Plovdiv produces output of €4.2 billion annually, of which half or €2.1 billion in manufacturing, €500 million in construction, and €260 million in transport and logistics. IT & professional services together generate annual output of €110 million. Unlike other regions in Bulgaria, Plovdiv has a well-balanced mix of manufacturing and services. Manufacturing is responsible for the production of €2.1 billion in 2010, which is about 50% of the economic output during that year. The relatively high share of the processing industry compared to other regions in Bulgarian and Europe is exemplary of Plovdiv’s leadership position in manufacturing on national and pan-European scale. Plovdiv also has a vibrant construction cluster, producing 12% of the region’s output, which unlike other regions, is primarily focused on non-residential construction and industrial space in particular.Due to its strategic location and excellent connectivity, Plovdiv has established itself as a leading transport and logistics hub. Transport and logistics companies create 6% of the production in the regional economy. Having a wealth of ancient historical sites, Plovdiv is a preferred tourist destination by foreign and Bulgarian travelers alike. The local hospitality business adds 3% to the annual production. 13% of the production in the region is generated in retail.Information technology and business services have been among the most dynamic sectors in recent years, providing new job opportunities and creating economic value. The local IT sector has been one of the very few sectors which experienced steady growth after the onset of the crisis in 2008. Business process outsourcing is another rapidly developing service sector taking advantage of the availability of young and well educated labor force. Bulgaria in general is very competitive on a global scale and has been ranked among the most attractive outsourcing destinations in Europe and the World according to the Global Services Location Index compiled by A.T. Kearney. IT and professional services together are responsible for 3% of the production in the region. The investment activity in the Plovdiv region remained high after the crisis. Purchases of long-term assets in the region amount to more than EUR 550 million annually. Plovdiv has a very balanced mix of investments which are allocated to different sectors of the economy. About 23% of the investments or €125 million are devoted to manufacturing for the purchase of facilities, equipment, and machinery, which enhance the productivity of the local enterprises. About 10% of the investments go into construction, which is focused mostly on industrial facilities and buildings. 17% of investments are made in real estate and 11% in mining, water and waste management. Due to the dynamic hospitality sector and strategic geographic location, retail, transport and tourism attract almost ¼ of all investments in the region. Close to 5% of all acquisitions of long-term assets have been made by IT and business services companies. Trakia Motorway – A1, which passes through the region, is part of Pan European Transport Corridor VІІІ and of the international road E 80 – Belgrade- Sofia-Plovdiv-Istanbul. First class roads intersect the whole region. The nearest port – Burgas Port, located 280 km away from the region, is easily reachable through highway, first class roads or railway. The second nearest port is the Thessaloniki Port in Greece, 330 km away from the region. The Plovdiv Airport, located within the region, is a hub for charter and cargo flights. A concession is pending, as well as capacity expansion that would improve substantially the cargo service of the airport. The Bulgarian capital’s airport – Sofia Airport is at a 140 km distance from the region. 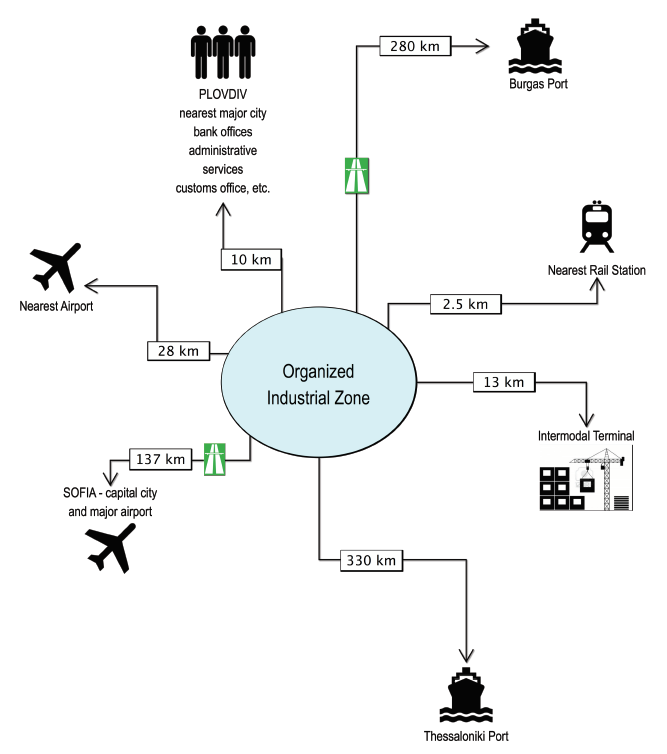 The region also has an intermodal terminal, a duty-free zone and a customs terminal. Plovdiv region has an extensive public transport system and very developed infrastructure which link the region with cities and towns all over the country and many European countries.